The REDD+ Academy Learning Journals are continuously being improved. Supporting materials for the REDD+ Academy training module on Safeguards: This subfolder contains supporting materials (handouts, etc.) to help the facilitation and running of REDD+ Academy training session on Safeguards. See description and how to use these resources in the Facilitator's Notes document here. Introductory presentations for REDD+ Academy training modules (Spanish): This subfolder contains supporting materials (PPT presentations) to help the facilitation and running of REDD+ Academy training sessions. See description and how to use these resources in the Facilitator's Notes document here. 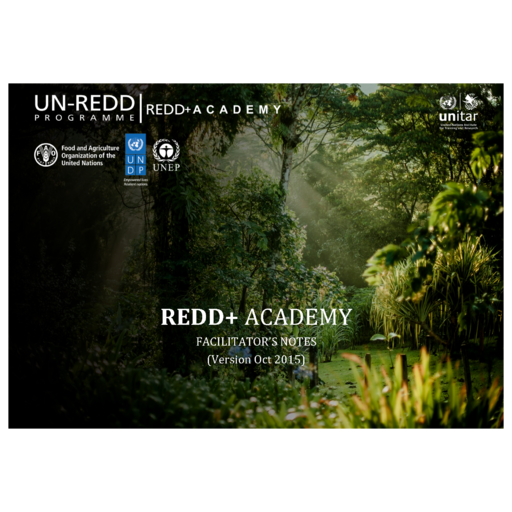 Introductory presentations for REDD+ Academy training modules (English): This subfolder contains supporting materials (PPT presentations) to help the facilitation and running of REDD+ Academy training sessions. See description and how to use these resources in the Facilitator's Notes document here. 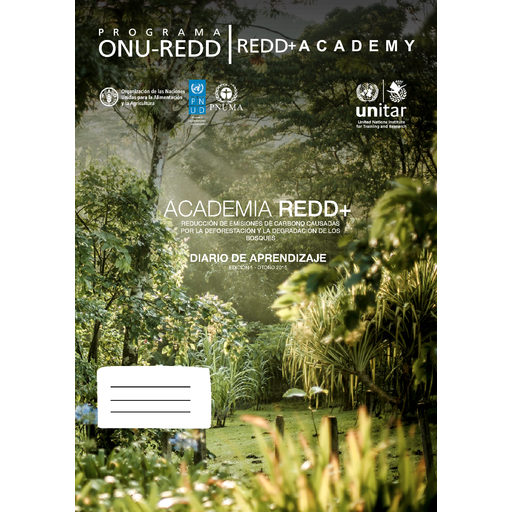 Handouts for the Facilitator's Notes document (Spanish): This subfolder contains supporting materials to help the facilitation and running of REDD+ Academy training sessions. See description and how to use these resources in the Facilitator's Notes document here. 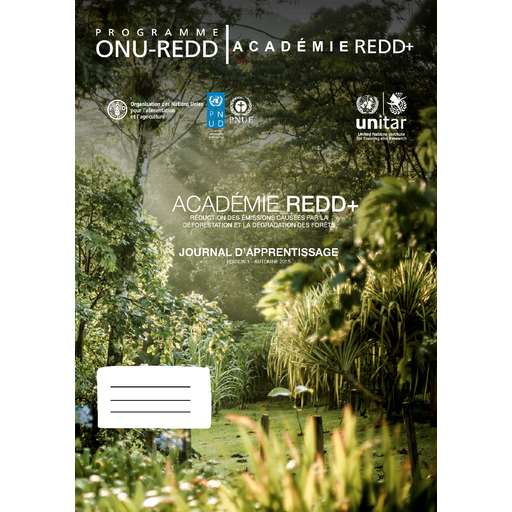 Handouts for the Facilitator's Notes document (French): This subfolder contains supporting materials to help the facilitation and running of REDD+ Academy training sessions. See description and how to use these resources in the Facilitator's Notes document here. Handouts (English) for the Facilitator's Notes document: This subfolder contains supporting materials to help the facilitation and running of REDD+ Academy training sessions. See description and how to use these resources in the Facilitator's Notes document here. In line with the objective of the REDD+ Academy to train trainers (ToT) who can replicate national level REDD+ Academy events on any of the various modules or groups of topics presented in the twelve REDD+ Academy Learning Journals (accessible here), the Facilitator’s Notes document aims at supporting the facilitator(s) of REDD+ Academy training sessions by providing detailed information on purpose of the training, draft agenda, materials needed to run the various sessions, facilitation techniques, group exercises, etc. The Facilitator's Notes document contains detailed advice and instructions on how to present each of the twelve REDD+ Academy topics - see also the twelve REDD+ Academy Learning Journals here, as well as how the Training of Trainers (ToT) element can be incorporated in the training event. Approximate timings are given for each activity, which can be adapted to the overall length of the REDD+ Academy training, as designed for the specific event. All supporting materials useful for running each of the sessions, including handouts (in English and French) and introductory presentations (in English), can be downloaded here. These are drafts that can be adapted according to the needs for specific training events. 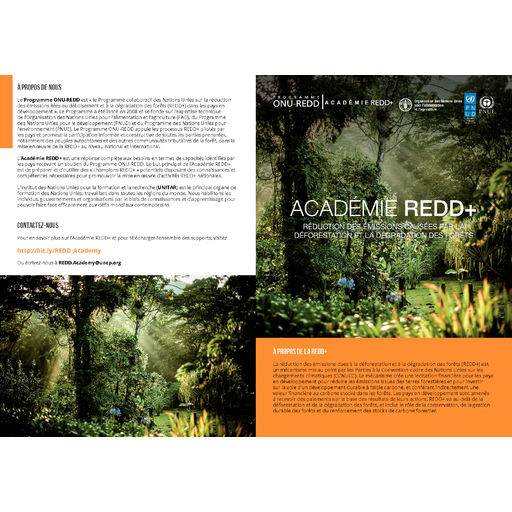 This REDD+ Academy brochure briefly describes the REDD+ Academy capacity building initiative and the related REDD+ Academy Learning Journal, with its twelve modules addressing key topics in REDD+. 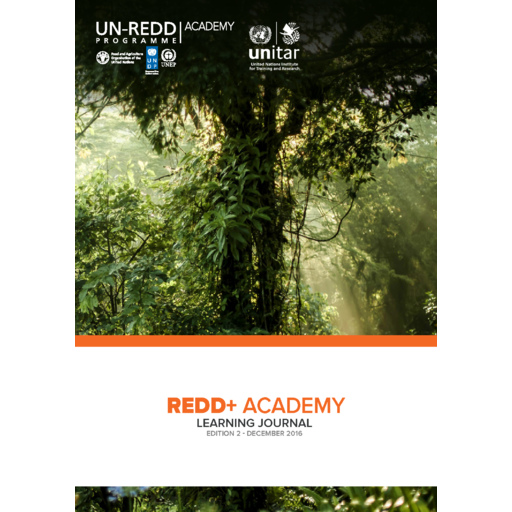 To support continued learning both during the REDD+ Academy training sessions and beyond, the UN-REDD Programme developed the REDD+ Academy Learning Journals. Addressing twelve key topics in REDD+, the Learning Journals are a coherent bundle of introductory information, detailed accounts and learning exercises designed to build capacity for REDD+ throughout the world. The Journals walk learners through the landscape of REDD+, from the carbon cycle and drivers of deforestation to approaches to finance and stakeholder engagement. The Journals also explore technical issues, such as the establishment of national forest monitoring systems and processes to address REDD+ safeguards. Designed to be used either as a complete course or as individual modules depending on the learners’ interest, the REDD+ Academy Journals offer a level of comprehensiveness and flexibility that matches the diverse needs of REDD+ practitioners. The Journals are available online in English, French and Spanish.